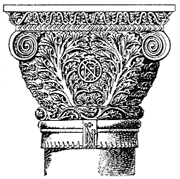 The reuse of Byzantine forms in the second half of the 19th century; an architectural mode found to a limited extent that borrows special features of Byzantine architecture, including pendentive-supported domes, round arches, elaborately decorated columns, and capitals. Phaidon Press sent the Prairie Schooner a paperback copy of Byzantium Rediscovered for review, suggesting that it could "be used as a catalyst for a local spotlight" because its final focus is on the Nebraska State Capitol, where architect Bertram Goodhue and mosaicist Hildreth Meiere employed the style and materials of the Byzantine revival that had spread throughout Europe in the hundred years preceding. 31) For a recent study of the byzantine revival in its international context, see J.
Byzantium Rediscovered: The Byzantine Revival in Europe and America (Phaidon, 45 [pounds sterling]) looks at the impact of this great empire on European and American politics, religion and the arts.